Described as “reframing Olivier Messiaen’s Quartet for the End of Time”, the inspiration for this disc was not so much the music of Messiaen as the story of its first performance and in particular the life of one of the performers who took part in that legendary première. It was prompted by the 2003 book For the End of Time by Rebecca Rischin, who has written the liner notes to this disc. In her book Rischin, who is herself a clarinettist, debunked many of the myths associated with that performance (including several instances where Rischin has been able to discredit Messiaen’s own recollections of the event). She also unearthed the subsequent life and careers of those original performers; and for anyone who has not yet read it, I cannot recommend her book too highly. In particular, Rischin tells the story of clarinettist Henri Akoka (“an Algerian-born Trotskyist secular Jew with an unusual sense of humour”) who seems to have been about the most intellectually and spiritually inappropriate person to get caught up in a work which has almost come to symbolise the power of Christian faith to transcend earthly tribulations. This book, and in particular the seeming incongruity of a Jew, as Matt Haimovitz writes in his introductory essay, working on “this piece inspired by the New Testament’s Book of Revelation”, prompted clarinettist David Krakauer and cellist Matt Haimovitz to frame a live performance of the Messiaen, given during their residency at the Banff Centre, with a structured collective improvisation devised by Krakauer and a remix of elements from the quartet combined with individual improvisations, sampled sounds drawn from Second World War voice archives, and electronics created by sound artist Josh “Socalled” Dolgin. This recording was made at that live performance. 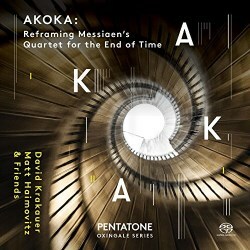 Krakauer’s opening improvisation, which he entitles Akoka after the clarinettist for whom Messiaen wrote the Quartet, opens with shriekings and shiverings, which have a distinctly Hebraic quality more in the nature of fervent prayer than anguished utterance. It is only as the performance evolves into something less dramatic and more intense, with desolated moaning from the cello, husky repeated notes from the clarinet and violin and jagged cluster chords on the piano that it begins to work itself up into something of a frenzy out of which pre-echoes of the Messiaen emerge. And, almost without our knowing it, the music has transformed itself into the Messiaen and it needs a physical check on the player’s digital display to be certain quite where the improvisation ends and the Quartet for The End of Time begins. As a performance this is as compelling and committed as they come, each of the four players clearly utterly engrossed in the music and fully attuned with its unique blend of musical mysticism and spiritual imagery. Balance is impeccable, not least in the opening movement where all the instruments seem to be playing behind a veil of the most delicate fabric. They burst out into the open in the second movement, where great, crashing gestures from pianist Geoffrey Burleson provide a vivid counterweight to the other-worldly meditations of cello and violin. Naturally the “Abîme des oiseaux”, the third movement of the Quartet and written with Akoka’s apparently metallic tone in mind, forms the emotional epicentre of the entire disc. Krakauer relishes being in the limelight here, and at times his performance possibly goes a little too far down the road of expansive gesture, making much of the pregnant pause and the delicately turned phrase, while launching into exhibitions of bird-song which have more about them the dramatic downward swoops of a bird of prey than Messiaen’s own imagined aviators flying up into the light. As an exercise in magnificent clarinet playing, however, this is in a class of its own, and certainly prompts the rest of the quartet to produce an exceptionally jubilant and effervescent “Intermède”. Not to be overshadowed by Krakauer, Haimovitz produces an exquisitely and intensely spacious account of the “Louange à l’Éternité de Jésus” in which equal praise must be heaped on Burleson for his instinctively sympathetic support, allowing this to have a tangibly timeless quality about it. After this movement, in which time seems almost to stand still, the vigour and rhythmic edge these four players bring to the “Danse de la fureur” has an almost physical impact, and the complete coordination they show in all aspects of the performance is deeply impressive. The final pair of movements transports us, as intended, on to another altogether higher plane, violinist Jonathan Crow soaring off into the ecstatic stratosphere to end the performance with exquisite remoteness. Clearly, much of the intensity of this performance derives from the fact that this was a live performance (to be fair, there is nothing in the recording which would imply anything other than a well-balanced, carefully adjusted studio sound), but equally obviously these are four musicians deeply imbued with the essential spirit of the work. There is the final piece of the jig-saw – the electro-improvisation derived from recordings made during rehearsal at Banff in May 2007, but, frankly, I could live without this somewhat contrived hotchpotch of regurgitated and rehashed sounds and its tiresome rock beat.